When Virtual Potluck was offered a baking cookbook, I was all for it. Then my husband ended up in the hospital, and I thought, "Who am I going to bake for?" Well, duh, NURSES need cookies, right? I picked this recipe because I liked the idea of peanut butter and chocolate. I mean, gee, I was planning on bringing them to the nurses, but there's always that issue of quality control. Once must inspect just a few cookies, right? It all went swimmingly until I realized I didn't actually have chocolate chips. So I cheated just a little bit and used some adorable mini M&Ms instead. Same idea, different color and shape. They're actually pretty festive, if you ask me. Flavor-wise, I think the chocolate chips called for in the actual recipe would have been a better choice though. AND I have something for YOU! Go past the recipe for details on how you can win this cookbook AND some goodies from Tate's. From Baking for Friends by Kathleen King. All rights reserved. Position the oven racks in the top third and center of the oven and preheat the oven to 325 degrees. Line 2 large rimmed baking sheets with parchment paper or silicone baking sheets. In a medium bowl, whisk together the flour, baking soda, and salt. In a large bowl, beat the brown sugar, butter, and shortening with an electric mixer set on high speed until combined, about 1 minute. Beat in the egg, followed by the egg yolk and vanilla. Add the peanut butter and mix well. With the mixer on low speed, mix in the flour mixture, just until combined. Mix in the chocolate chips. Roll the dough into 30 walnut-sized balls. Arrange about 2 inches apart on the prepared baking sheets. Using a dinner fork, press an X into the top of each cookie, flattening it to about half of its original thickness. Refrigerate the remaining dough balls on a plate while you bake the first batch. Bake, rotating the positions of the sheets from top to bottom and front to back halfway through baking, until the cookies are golden brown, about 20 minutes. Let cool on the baking sheets for 5 minutes. Transfer to a wire cooling rack and let cool completely. Repeat with the remaining dough balls, using cooled baking sheets. 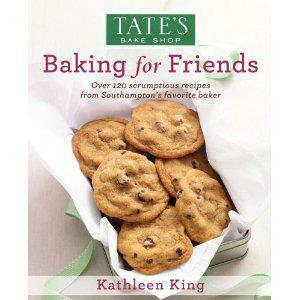 You can win a Cookie and Bar Tower from Tate's Bake Shop, as well as a copy of Baking for Friends by Kathleen King! Giveaway includes: the boxes are assorted but typically include: three 7-oz boxes of cookies, one each of chocolate chip, oatmeal raisin and white chocolate chip macadamia nut. Two rich, buttery raspberry bars, two chocolate chip and walnut loaded blondies, and two rich, dense and fudgy plain brownies round out this crowd pleaser. Each 7-oz box contains approximately 12 cookies, and bars measure 4" x 2.75". To enter, leave a comment telling me what your favorite cookie is. That's the only mandatory entry, but if you want to up your odds of winning, you can do any of the following and leave a comment telling me you've done so. You can find buttons and a Facebook link on the opt right of the sidebar that will make it easier for you to find me. And that's it. Five possible ways to enter. Good luck! The contest begins on October 9 as soon as this posts and ends at midnight, mountain time on Saturday, October 13. Prizes will be shipped by the sponsor. US residents only. Disclaimer: This post is sponsored by Tate's Bake Shop. 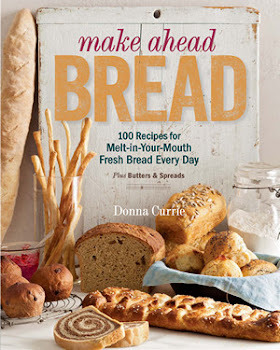 If you don't win the book, you can buy one at a discount ($19.95 is price) if you use the promo code BAKEOFF on the Tate's Bake Shop website at checkout. 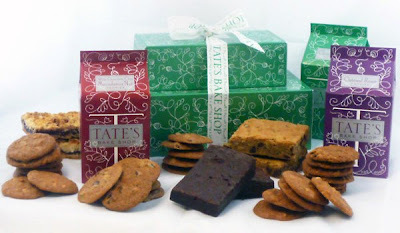 Tate's is hosting a Facebook recipe contest with a $1,000 cash prize for first place. Enter here.